I have never changed my weight on my drivers license. Ever. Not in twelve years, not even in changing states. The good news is I'm almost back to it. Ha! I've got some incentive for you over on my blog. Join me!! Girl, I totally know what you mean. I gained 50 lbs in the last year and still am in denial that its sticking around for good. While I've gotten rid of most of my "skinny" clothes, I still refuse to buy many bigger sized clothes 'cause this weight? It ain't stickin' around. Despite the facts that I rarely exercise and had 2 pieces of cake yesterday. And I keep thinking, why lose the weight? If I get pregnant, I'll just put it back on. So, I'll just get pregnant and not gain a pound. See? So simple. Amazing how I can delude myself. It's OK, baby. You know we still love you. As for your motivation? Sometimes you just need to give yourself a break, tell yourself it's OK to not be exercising so you're not making yourself feel guilty about it. Once you can get all zen with it, the motivation will come back. Maybe take a walk around the block after dinner with Luke instead of hitting the gym (an option that's far more appealing in June than January, I realize). Whatever you do, don't be too hard on yourself about it, because that will be totally counter-productive. I finally changed the weight on my driver's license when I moved to IL last year. I am still not close to the weight, but it's what people would guess I weigh. It's obvious I'm extremely overweight, but people don't know that I weigh as much as I do...probably because I'm 6' tall. Going back on the weight watcher's wagon...so hopefully will be at the weight on my driver's license by the end of the year. No one asks for my weight. I might punch them if they did. I just looked at my DL to double check that they don't put weight on them down here. And I was right. I didn't think I remembered them asking for a weight. I love love love what Molly is doing! They don't ask for weight here. But, if they did- I would totally lie. By like 60 lbs, while looking them right in the eye & just daring them to contradict me! My driver's license has said 121 since I first got it. And I probably wasn't even 121 then. You're dessert looks yummy. It also looks the exact same as it does out here in Seattle. Good to know that TCH is consistant! For years my drivers license said 120, and I have weighted more than 120 for decades. Since the conscientious people at the Bureau of Motor Vehicles never asked if there was a change, I never bothered to tell them my correct weight. Then about six years ago, one of the BMV babes asked if there was any changes, I told her truthfully that my weight was 140. Okay, that is not true, but I meant for my weight to be 140. Without asking, the b*tch changed my hair color on the license from brown to gray. Now, my hair has been gray for a longer time than since I weighed 120. But there was nothing that has made feel older than the the three letters GRY on my driver's license...nothing except when I realized that I needed to buy a swimming suit with a skirt. Sheesh. Maybe a law should be made that all women weigh 120 according to their driver's license. Frema, maybe the fancy schmancy scale weighs heavier than your other scale...so you should automatically subtract three pounds. 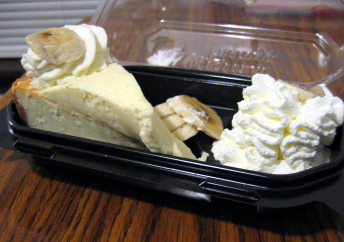 Although the tiramisu was fine, I liked the bite of your banana cheesecake way more than the whole of my own slice. Next time, I'm getting the banana. I just got a replacement license yesterday, but I didn't even look at what I said my weight was, until just now. I'm surprised to discover that I didn't lie much when I first got it, the weight it says is about what my pre-preggo weight really was. Of course, that's about 15 lbs from now, and another 15 lbs from where I would like to be. And even that is about 15 lbs from your driver's license. I don't think I ever claimed 120. Maybe on my first license. That dessert looks damn good, although I like the key lime cheesecake. Oh soooo good. To answer your question, I do give myself a 2 pound blood and bloating cushion. But by day 4, I expect the weight to go down because when it doesn't, then I start getting worried. I have stretched it out to day 6 or 7 or 20 before though.